Secret smiles are a modern day orthodontic system that are fitted lingually (the backs of the teeth) to your teeth. Because they are fitted at the backs of the teeth, they are 100% invisible! This tends to be a very popular choice with people who have customer facing roles or enjoy a busy social life – even celebrities in the lime light! Having to get your teeth straightened (at any age) can be a very daunting thing to go through. Long gone are the days of traditional braces, where you had to have a mouth full of bulky metal. This treatment is ideal for patients looking at a discrete and comfortable way to have straight teeth. This particular lingual brace has been specifically designed to focus on your front teeth, without affecting your back teeth or the bite. This is mainly aimed at giving you a cosmetic straight smile, in shorter treatment times (can be 18-24 months for correcting bites). Am I Suitable For This Brace? How Does Secret Smile Work? The orthodontic field in dentistry has come on in leaps and bounds over the past years. More and more treatments are been developed to be more in-line with the patients needs, allowing for gentle ways to straighten teeth. Can You see the braces? In short no. The braces will be fitted to the tongue side of the teeth, and will be discretely hidden by your teeth – making them completely invisible! Are there any foods to avoid? It is recommended to stick to a healthy diet during treatment, specially avoiding any sugary drinks/foods, as well as crunchy hard foods – as these can damage the brace. Why are secret smiles quicker? This brace has been designed to focus on improving the cosmetic aesthetics of the smile rather than treating the bite as well – this significantly reduces the overall length of treatment time. Will I need to have a retainer after treatment? Like any other brace, is is very important a retainer is worn after treatment. It is your bodies natural response for the teeth to try and shift back to their original position. We offer bonded retainers as well, which are fitted to the backs of your teeth for discrete retention. At our practice we are happy to offer free consultations so we can discuss all the suitable treatment options available to you. We understand that price can be a sensitive issue and a worry for many patients, we are also able to offer flexible monthly payment plans to help break up the cost of treatment for you. Please do not hesitate to call us today and book your free consultation. By submitting this form, you understand your data gets processed in accordance to our privacy notice. 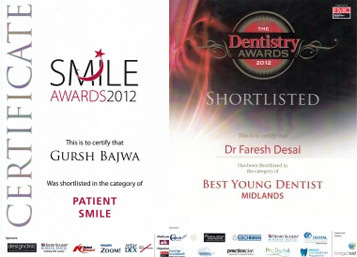 Tamworth Dental & Implant Clinic are proud of the range of awards that we have received for our quality and patient care.